feel like I’ve just munched an entire bag of Revels and not found a coffee-cream among them. 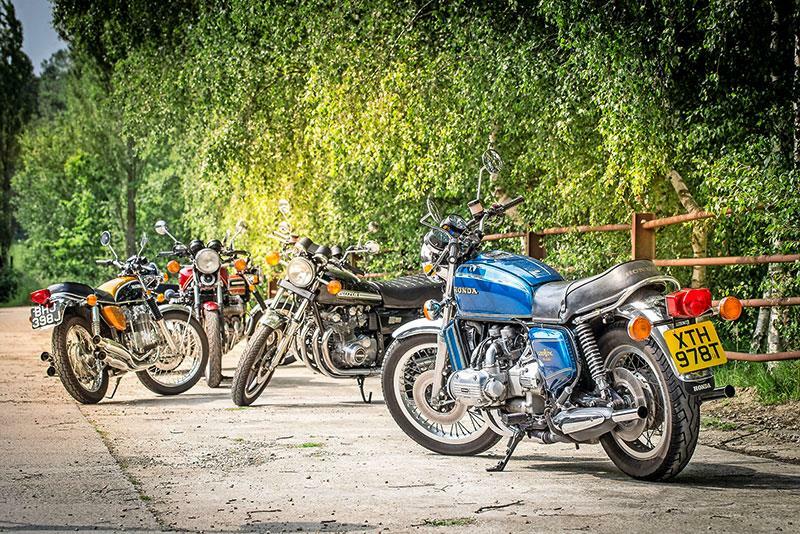 In the space of one incredible day, I’ve ridden a Kawasaki Z1 and H2, a Honda CBX and Goldwing, a Suzuki GS1000 and GT750 and that epoch-making pair, the CB750 and CB500. They belong to Paul Brace, a man who follows a strict formula to determine the exact number of Japanese superbikes he needs: n + 1 (where n = the amount of motorcycles he currently has). 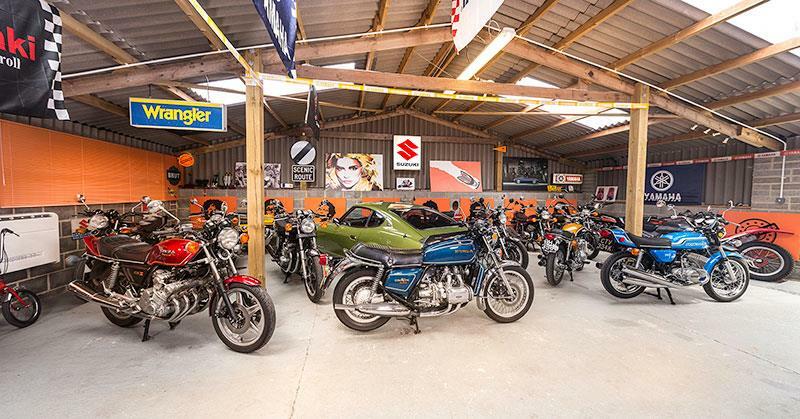 Paul’s place feels like it has the lot: amid multiple H2s and Z1s, and the other icons such as a 750 Sei, RD400 and 400/4, there's a pool table, a beer cabinet and a lairy orange sofa which matches an immaculate Bond Bug. There's also a Datsun 240Z, to add some car-shaped Japanese craziness to the two-wheeled muscle. Seventies tunes are piped through Paul’s sound system. The walls are lined with Seventies icons such as Debbie Harry, Johnny Rotten, and Jims Hendrix and Morrison. Look even closer and you'll also see plenty of period ads with – cover your 21st-century eyes – scantily clad women draped over the bikes. Oh, and there’s a spacehopper and a Raleigh Chopper. 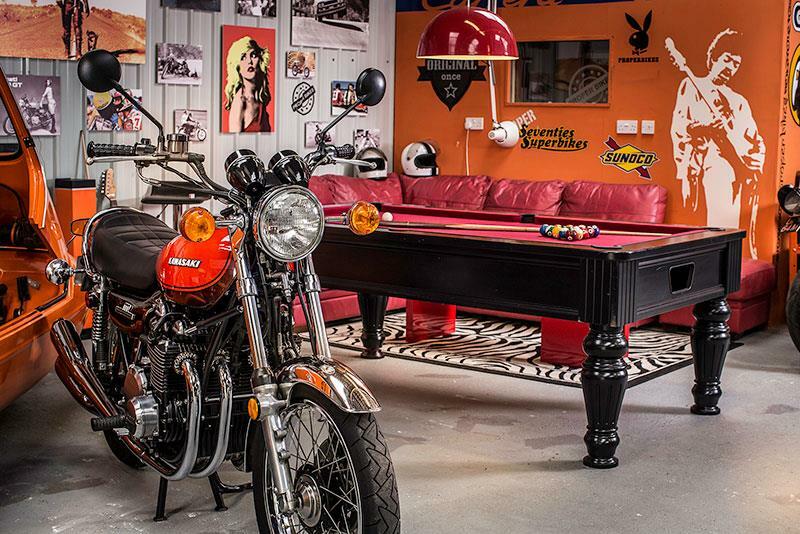 Paul created his man-cave inside a rural barn when his collection outgrew his suburban garage. The machines are mostly low-mileage and unmolested. “I much prefer unrestored bikes,” he says. “Japanese motors often don’t feel as good when they’ve been dismantled and rebuilt. 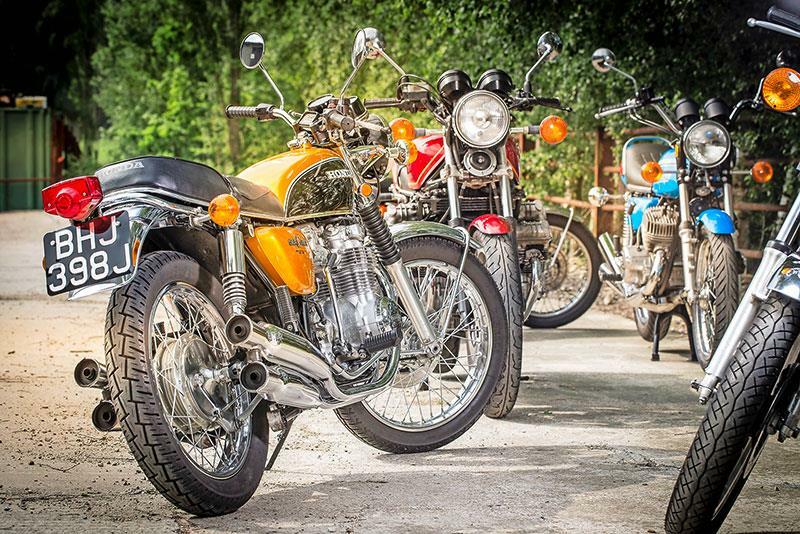 I have yet to ride a restored one that is anything like as good as the few that haven’t come to bits.” The weather outside is broiling hot and stormy. We’ve got a busy day’s bike-sampling ahead, but which machines to choose? It’s the ultimate kid-in-a-candy shop question. There’s no way physically to get all the bikes ridden properly. Ha, I thought, I’ll list my own – based on the day’s riding, plus a lifetime of prejudices. But Paul’s opinion turns out pretty well spot-on. Seventies superbikes they may all be, but they are all so different that you can’t really compare them, only bask in their amazing diversity. 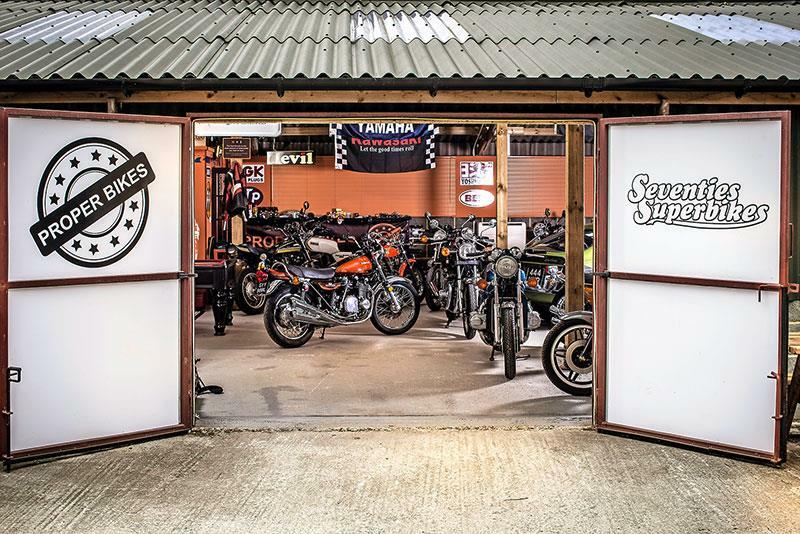 If you want to try compiling your own rankings, you can see all the bikes being ridden and admired on a YouTube film we made of the day (The Story of Seventies Superbikes). If you learn nothing else, you’ll see a grown man fall off a Raleigh Chopper while attempting an ill-advised wheelie. Yes, that was me. I’ve still got the scars to mark an unforgettable day’s experience. Paul: I used to loathe these bikes and would never dreamed I would own one – they just looked so lardy. Now I’ve got two of the things. I had a weird desire for one a couple of years back and became increasingly intrigued to discover what they rode like. It took ages to find a nice one that wasn’t too high-mileage and in unmolested condition like this. Was it worth the hunt? Definitely. They are lovely to ride; smooth, quick and surprisingly agile. It has given me aspirations of touring Ireland or Scotland on it with my wife, Julie. It would be a delight if the pilot jets offered a little more resistance to getting blocked though – I am so fed up with cleaning carbs. John: I’ve avoided old Goldwings for decades. Thanks not least to contemporary road testers labelling them pointless behemoths, which does beg the question: should the Wing even be included in our list as a true superbike? One trip is enough to say hell yes. This is the biggest surprise of all the bunch. I was expecting a lardy old Bertha and instead got a magic-carpet express ride. The bike’s low centre of gravity – thanks to the sunken fuel tank and flat-four motor – make the Wing surprisingly slingable (you wouldn’t want to push your luck, though). It also gets an excellent hurry-on down the straights of Paul’s lumpy local A and B roads, simply giving a broad-shouldered shrug when encoutering each bump and dip. If you get silly with the gearbox, it will protest at the rear with a lurch of torque reaction from the shaft drive, but it never gets the bike out of shape. In similar manner to the way Honda’s CB750 gently introduced riders to the world of superbiking, the Wing was a no-tears taster for the new world of super-touring. 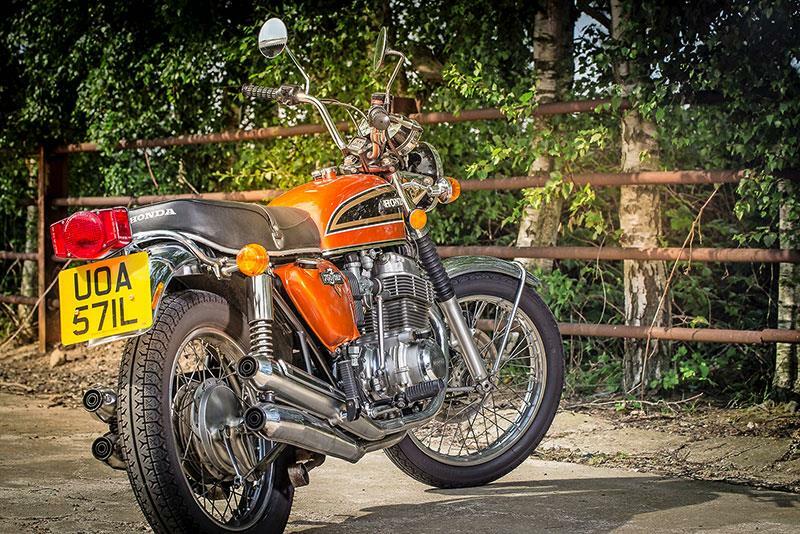 Paul: The CB750 never really had much appeal in my youth as it was so staid. I wasn’t desperately keen for one nowadays, but how can you have a Seventies superbike collection without the first of the breed? If I found a 1969 KO as nice as this K3, I would be keen to change purely for the enhanced collectability. But I am not fussed enough to pay the ‘sandcast’ premium. 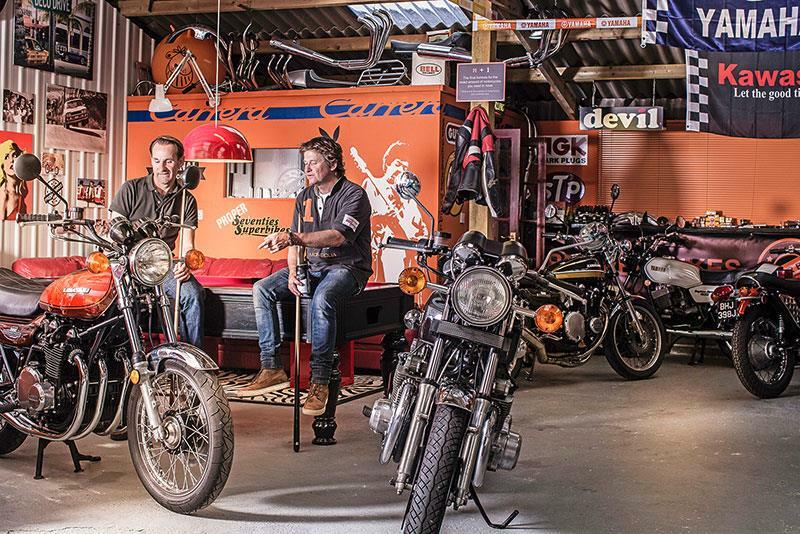 A mate, James Harrington, is an expert on old Hondas and always has plenty. He supplied me this lovely original low mileage ’73. The first ride was a big surprise – smooth engine, light controls and way more nimble than I expected. They don’t have enough power to set the world on fire but I enjoy riding it and the CB750 has a solid place in my collection. James also supplied me with an incredibly untouched K2 model as well. But I normally ride home in the dark and the right-hand dip-switch is just ridiculous. I would love to know the reasoning for such poor ergonomics and I am not surprised there was a factory bolt-on left-hand switch. 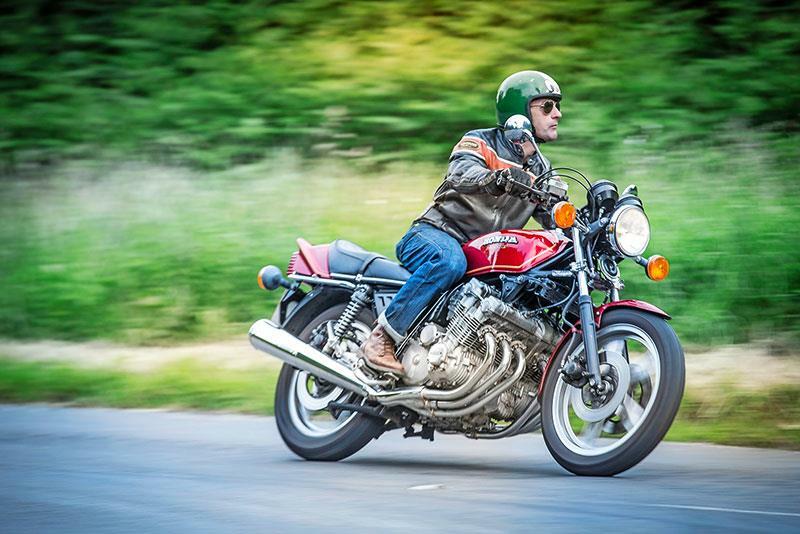 John: The CB750 isn’t there to shock or surprise you. Instead, Honda created a sure, gentle and predictable introduction to the superbike era, so as not to scare away buyers. 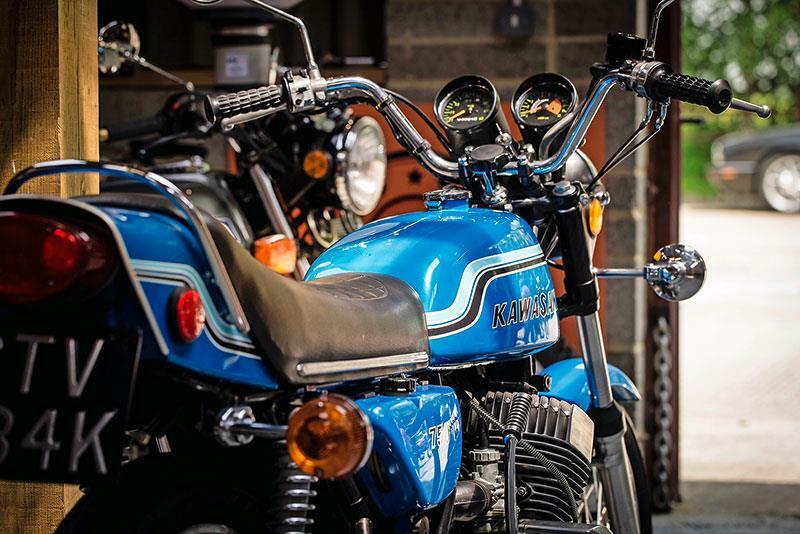 Put in historical context, the 750 is an incredibly capable and sophisticated piece of kit. It accelerates and corners fine, but thanks to the lack of on-road wow factor, it’s too easy nowadays to take these bikes for granted. That’s not to diss the bike’s easy street manners, which make it a superbly practical classic to ride nowadays. But in wild seventies superbike terms, it feels a tad bland. Got to love that metalflake orange paintjob, though. Paul: A first-year H2 is a rudimentary component of the collection. Not having one in the inventory would be like having a toolkit without a hammer. You have to be in the mood for a ride on one of these, but when you are, it is a real grin. They make a bit of a racket, lack any sophistication and are more suitable for a short blast – I wouldn’t really go anywhere on one. I wish I had ridden an H2 when I was 16. I remember what a 250 single felt like back then and multiplying that by three would have been mind blowing. Even today they have bags of torque. They are not as mental as the reputation suggests but that is probably due to 100bhp being normal today – 74bhp is not going to frighten anybody now. The legendary unstable ride is indeed a bit disconcerting if you lack confidence. But they do nothing worse than buck a little beneath you. Did anybody actually get thrown right off? Paul: “These are great bikes but lack charm, which I can only think is due to the relatively bland styling. It is certainly not the performance. They will decimate a Zed on the road. The performance advantage is unsurprising, considering Suzuki had more than five years of Kawasaki/Honda hindsight to exploit. Then they had a dress rehearsal with the GS750 before boom; say hello to the sledgehammer. 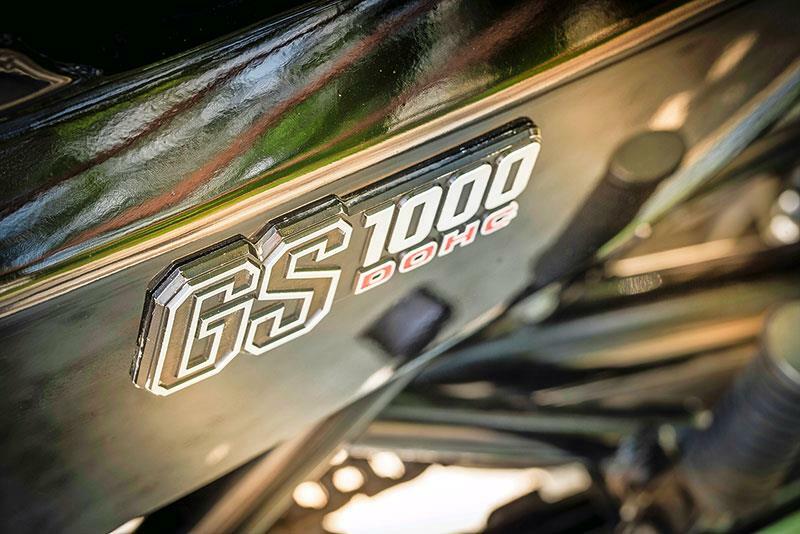 Unlike a Goldwing or CBX, however, a GS1000 doesn’t shrink when you pull out from the curb. They are a big unit at rest and nothing changes when the wheels turn. If that’s an issue, get a GS750, which is a lovely all-round package. Nice GS thou’s are going to become valuable soon aren’t they? Try finding one that hasn’t been generally buggered and has still got nice original pipes. After years and years of looking I have found only three exceptional original and standard examples. But to be honest, I still haven’t found ‘the one’ for me yet. John: Not sure how I’ve never got to ride one of these before – even though I’ve been after buying a decent ice-cream-van S model for ages. When I was but a sports-moped rider, all the really old guys (aged 20-25) were gravitating to GS thou’s. Somehow, that’s cemented these bikes in my mind as muscular brutes. My initial impressions, piloting the bike up a cement ’n gravel farm track, seemed to confirm such fears: the front end felt heavy, the steering tiller-like, the broad seat and tank feeling barge-like beneath me. Once on the road, however, with the speedo sweeping briskly round the dial, the Suzy’s balance and dimensions made immediate sense. The bike really wants to accelerate and it never feels like it’s going to get out of hand. Why aren’t they more sought-after? I guess they heralded the advent of the UJM. In fact the charisma’s all there, but it’s hidden in the saddle rather than visible from the side of the road. Paul: I just love the lines of this bike. There is something so right about them. Then again, I have to say that it is a bit small for me. I prefer the feel of physically bigger bikes. They make the ride feel more epic. This one has so few miles (less than 3000) that it still rides very tight, the gearbox particularly. But it will howl happily up to the 9100rpm redline. I bought this one off eBay because of its jaw dropping unrestored condition – plus it is an extraordinarily attractive and beautifully proportioned motorcycle. It’s a US import and wasn’t cheap, but I jumped on it as soon as I saw it. To ride? A bit of a disappointment to be perfectly honest. It is like a CB750 only less so – and the low mileage goes against this one, because it is still a bit tight. It will be nicer with a couple of thousand more miles under its belt but I am not convinced it constitutes a superbike. So if it doesn’t start ringing the right bells after the next ride or two, I may stick a price on it. I can see the appeal of a smaller bike on the right day, but on those days I would jump on the RD400 – crisp and lively with addictive acceleration and so physically light that it feels like a 250 beneath you. John: Is it a superbike? 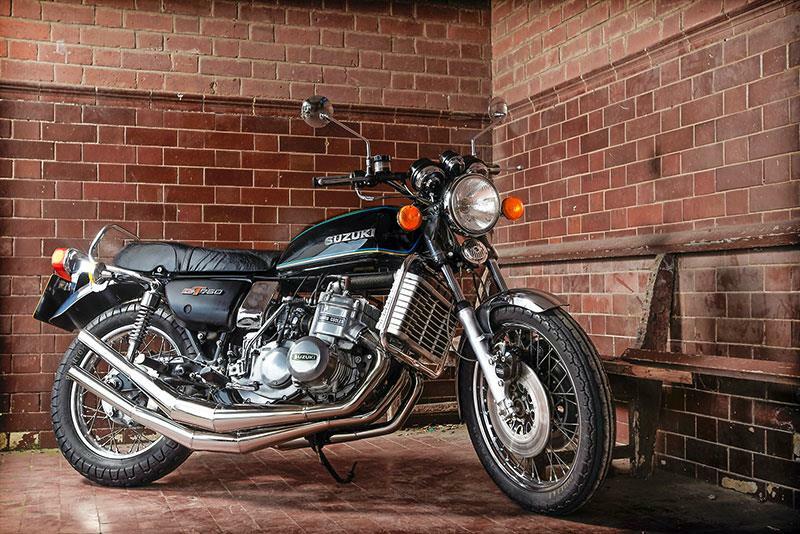 It was certainly thought so by many buyers in the seventies who still thought that a 750 was too much. This bike is truly immaculate. With less than 3000 miles on the clock, it is original except for the 4-4 pipes, but they’re Honda stamped, so who cares? Absolutely everything works, too – even the seizure-prone front caliper. The rear brake makes the bike bounce a bit on road bumps, but that’s how they were. It’s as though you’ve just taken it out of the showroom. The only symptom of underuse is a slight carburettor hesitation at low revs. The tender ministrations of Dr Miles would surely rectify that. 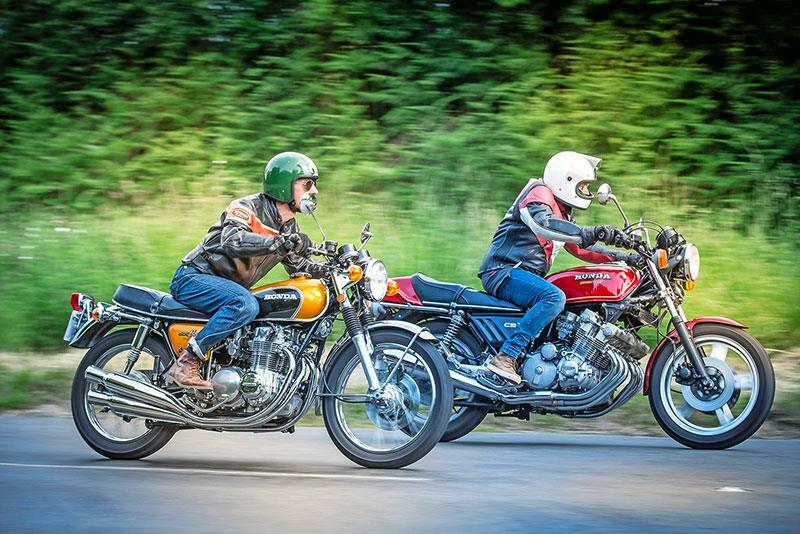 People go on about the 400/4 being a jewel, but the CB500 is barely any bigger – just enough to give a real-bike feel. Riding on Pirelli Demons front and rear, the handling is light, particularly on this example. The engine, though a little tight, happily zips to the redline, going from whistling purr to trademark howl. To me, it’s perfect. Paul: The kingpin of my collection and a clear favourite. They have the legend, the looks, the performance and all the charisma. If the building caught fire I would drag this out first. It is predominantly unrestored, with all the original bits bar the exhausts, but, having had a repaint and handful of plating, it looks really bright and sharp. A guy came over a few weeks ago and offered very good money but I just couldn’t bear to part with it. I would feel compelled to find another like it ASAP. That is not an easy task now – unless you are happy with a fully restored one, which I am not. Riding a 900 Zed makes you feel like the dog’s bollox. They have tons of road presence and to see another Z1 on the road gives me the same buzz of excitement as seeing a Lancia Integrale – weird really. I pretty much like everything about them but wish the standard engines felt crisper – even the good ones feel a tad woolly. John: Is this really a 1973 big Zed? I’ve owned and ridden all the other years’ examples – from Z1A to Z900A4, and had been led to believe by other road testers that the first-year model is markedly more spindly and shaky than later examples. No way. This Z’s motor is super-smooth, as are all its controls. It is also meatily powerful as well. You can see why this machine was such a sensation on its launch. It can be pitched about with easy abandon through corners, especially on its modern Conti Classic Attack tyres. Paul’s Z1 and H2 feel like they come from two very different marques, sited in two very different time zones, in wholly separate universes. Only one of those universes was run by a just and beneficent deity. Paul: I love these. The noise is distinctively evocative, they have bags of torque and they look substantial. They are really civilised too. I can’t think of another two-stroke that would be as good for taking a pillion or contemplating a lengthy road trip. The two-stroke surge on light throttle is a pain though, even after the usual carb jet mod – you can ride around it, but it would be nice if it was not there at all and you could cruise in traffic without having to trip up and down the box. This B model is low mileage and unrestored, just how I like ’em, but I would dearly love to find an A model the same. The B’s looks are cheapened by the GS-style front mudguard; satin black side panels and black headlamp brackets. The previous model just looks brighter. John: Oh, comfy, comfy, comfy. The kettle’s riding position, plus the storming torque, really make this bike feel like a pukka grand tourer, even in company such as the Goldwing. Only the wooden front brake lets it down in this respect. That said, the GT is no slouch. These later engines were a little more highly tuned and this one revs happily into redline territory, if you’re not careful. I agree with Paul that the motor’s low-end stutter can get annoying. So, too, can the way the airbox pulses through the seat. Those minor annoyances seem a fair price to pay for the creamy power and the beautiful, if muted, noise. Paul: These are the absolute business. Getting off an H2 and onto a CBX feels like striding straight to the end of a motorcycling century rather than decade. But they still have plenty of period appeal and are a milestone classic. CBXs give you lush silky torque and confidence-inspiring handling topped with an utterly addictive soundtrack. I do more miles on the CBX than any other bike in my collection. Mostly because it is such a joy to ride but, to be honest, partly because this example is a bit more weathered than the rest and so I am not too precious with it. I would love to find a sharper unrestored one and am still sore that I couldn’t get the money together in time for an absolute gem that Cosmo Classics in Hastings was offering recently. If I had a criticism, it would be that the fuel range is low, despite an apparently large tank, and the skinny rear tyre looks ridiculous on such an imposing machine. John: Last time I rode one of these, it was at the Bruntingthorpe proving ground. It didn’t feel so rapid on the wide track there, but down a twisting country A-road, it feels massively fast, as well as (initially) dauntingly wide. The big smooth turbine of an engine puts the scenery in reverse at an easy twist of the throttle. All the other controls are disarmingly light as well. Once I’d got over my fear of the bike’s bulk, I was amazed at how enthusiastically it tips into corners. All that “sophisticated” dashboard styling looks a bit dated now, and not in a particularly endearing way – it’s all a bit Ford Escorty, in fact. But as a complete package, the CBX is a totally fitting way to end the story of the greatest superbiking decade the world will ever see.